Despite a soft US lead, the local index opened higher and didn’t really look back today, particularly in the last few hours of trade where the bulk of the rally happened. There was no real news to drive the market higher, at least nothing that hit the boards in the afternoon when sellers seemed to disappear. Banks were all strong, with each of the Big 4 adding more than 1.5% - Commonwealth bank (ASX: CBA) was the standout with +2.41% on the day. Most notably though was the move up the risk curve with the growth leveraged sectors of tech & energy doing the best, whereas the safety of telcos, industrials & the consumer staples underperforming on the day. A number of the dogs rallied strongly today as well. 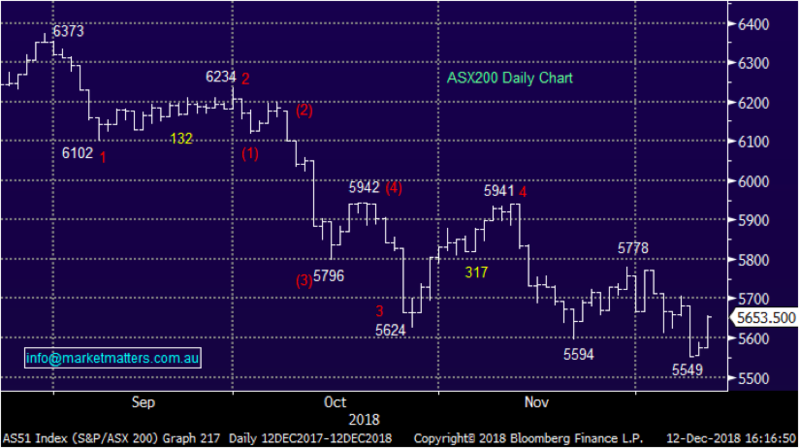 Some of note: Challenger (ASX: CGF) added 4.63% after bouncing off multi year lows early in the day, Bluescope (ASX: BSL) added 4.71% & Automotive Holdings (ASX: AHG) climbed 5.28% after setting a new 5 year low yesterday. Despite the solid rally, it’s hard to get too excited just yet as we are still short of where the index was trading on Friday. One factor that did help the gains today was a report out from NAB that suggested the bulk of the house price falls were behind us, revising their expectations to a 15% slump. Despite this upgrade, the NAB economists are still concerned with consumption as many households feel the wealth pinch due to the falling prices, extending the time they expect the RBA to remain on hold out to the back end of 2020 while seeing unemployment falling and growth slowing to 2.5%. 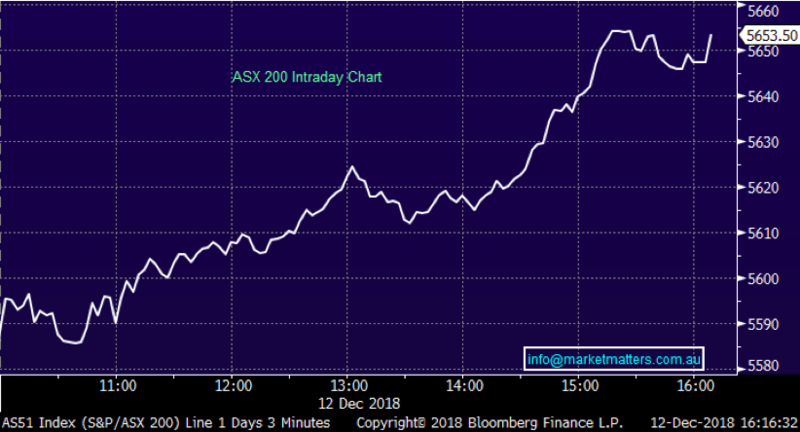 Overall, the ASX 200 closed up +77 points or +1.39% to 5653. Dow Futures are currently trading up 122 points or +0.50%. 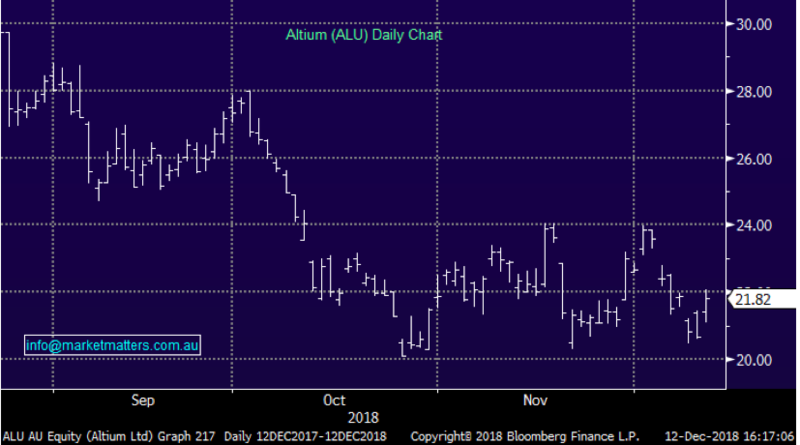 Broker Moves; This morning Goldman Sachs initiated coverage on Altium (ASX: ALU), a stock we hold in the Platinum Portfolio, with a buy and fairly aggressive price target of $28.50, versus yesterdays close of $20.60. A move like that is obviously positive but more importantly, the new coverage from a bulge bracket brings a new cross section of clients that now have ALU on their radar. Goldman’s provide research for CommBank which has the largest retail network in Australia through Commsec. I’m not sure of the timing that research is released through the network (probably a delay) however we’d expect it to generate additional interest / buying in the stock. We remain bullish ALU targeting the $24 region in the short term. The stock added 5.56% today to close at $21.82. 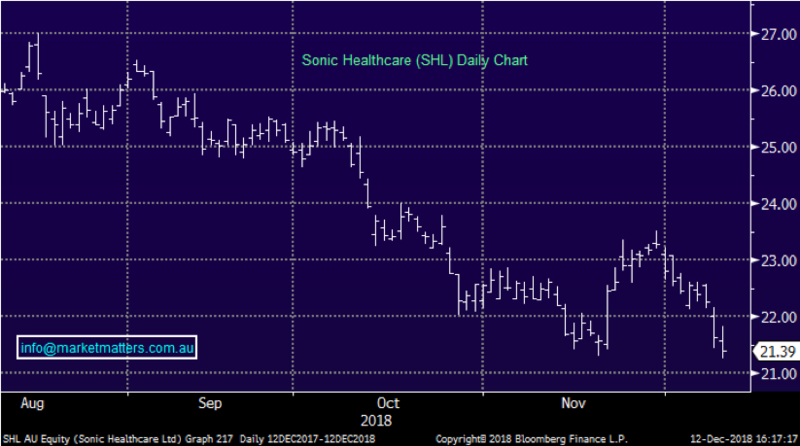 Sonic Healthcare (ASX: SHL) $21.39 / unch ; largest ASX-listed diagnostic imaging facilities group is about to get bigger after it went into a trading halt to announce a US$540 million ($750 million) acquisition and a large capital raising this morning. Sonic Healthcare struck a deal to acquire US-based Aurora Diagnostics, which will make it the third largest player in the US market with Aurora generating $US 310m revenue and $59m EBITDA in 2018. Sonic will be looking to raise around $US 700m from investors to fund the deal at around a 9% discount to last close, with the deal looking to add 3% to EPS in the first year. One to watch here as Sonic looks to grow despite its share price fall. Want to receive daily market updates?